What is the 21-day Days of Prayer and Fasting? It is making a commitment to start the year off by making God our highest priority. We do this by deciding to follow Him in specific areas of our lives for 21 days. Well, there is nothing magical about it, but that is the generally accepted number of days that it takes to establish a daily habit. And that is the goal. Below you will find helpful tips and a useful guide regarding How to go about prayer and fasting, suggestions of What to pray for, and some ideas about When you can fast and pray. You will also find more detailed information about the Daniel Fast and some Helpful Links to Additional Resources. It has been said that prayer is our connection to God. Prayer does not change things as much as it changes us. You will see the difference in your relationships, work, family and every area of your life when prayer becomes a priority. Prayer is simply telling God what is on your heart. You need to make a personal commitment to pray and take the challenge as you feel led. We want this to be about cultivating a personal prayer habit. Here are some suggestions for how to pray and what to pray for. Start by Reading Scripture: Read the My Time daily Devotional or find another Reading Plan. The You Version Phone App is a great resource. Write down anything that sticks out to you from what you read. Was anything said in the scripture that you need to work on, encouraged by, you can encourage someone else with, you need to confess, you need to claim as God’s promise, etc. PRAY. Pray over the scripture you just read and for what you wrote down. Believe God for answered prayers to specific needs. Declare our dependence on God in every area of our lives. Invite the presence of God in our church and our lives. Seek ways to help others draw closer to God. Cry out to God for revival in our generation. It is less about your plan and more about your motivation. If you are desperate to know God more He will honor your plan. The way you break bad habits is by establishing good habits. And one of the most significant God habits is prayer and scripture reading. The goal of the 21-Days of Prayer and Fasting is to cultivate a daily discipline. If you pray, read scripture, and lead your family daily for twenty-one days, there is a good possibility you’ll still be doing it on day 41, day 57, day 365. The goal of fasting is to draw nearer to God. Biblical fasting always has to do with eliminating distractions for a spiritual purpose. Fasting hits the reset button on our soul and renews us from the inside out. Remember, your personal fast should present a level of challenge, but it is very important to know your own body, your options, and, most importantly, to seek God in prayer. Below you will see details on the different types of fast. COMPLETE FAST – This fast calls for drinking only liquids – typically water with light juices as an option. You may want to do this one-day a week. SELECTIVE FAST – This fast involves removing certain elements from a diet. An example of a selective fast is the Daniel Fast; during which you remove meat, sweets, or bread from your diet and replace it with water or juice and fruits and vegetables. PARTIAL FAST – This fast involves abstaining from food for a certain period of time during the day. It can be from sun-rise to sun-down, breakfast, lunch, or dinner. Remember, it’s not about skipping a meal – It’s about connecting with God in its place. SOUL FAST – This fast is great if you do not have experience fasting food, have health issues, or wish to refocus an area of life that might be out of balance. It involves anything that typically connects you to the world and distances you from God. It might be computers, watching tv / movies, video games, social media, etc. It could also be reading the Bible in place of other things you might normally do. The Daniel Fast is a biblically based partial fast. It is a method of fasting people all over the world are using as they enter into the spiritual discipline of prayer and fasting. There are two anchoring scriptures for the Daniel Fast. In Daniel 1 the Prophet ate only vegetables (that would have included fruits) and drank only water. Then in Daniel 10 we read that the Prophet ate no meat nor any precious breads or foods and he drank no wine for 21 days. So from these scriptures we get three guidelines for the fast: 1. Only fruits and vegetables 2. Only water for a beverage 3. No sweeteners and no breads. 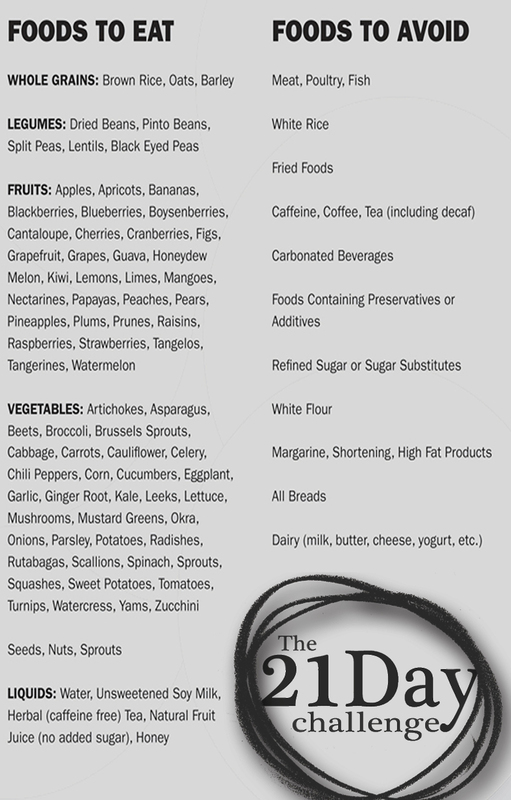 See below for the full list of foods and drinks available during a Daniel Fast.